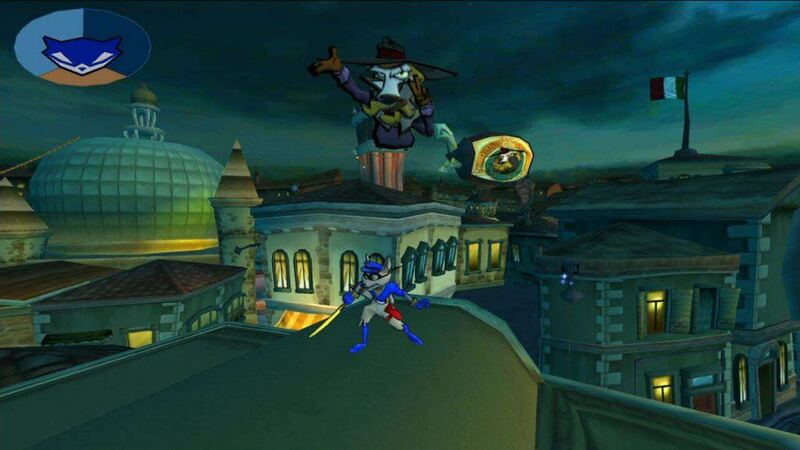 Sly Cooper and the Thievius Raccoonus was released on Playstation 2 on September 23, 2002. Developed by Sucker Punch, the story follows Sly Cooper, a master thief from a long line of master thieves. As a child, his family was murder by the Fiendish Five and his birthright and legacy, the Thievius Raccoonus, was stolen. As an adult, teamed with his best friends Bentley and Murray, he vows to take down the organization and reclaim what is his… and maybe plunder a little along the way. Sly Cooper is just as much a Playstation icon as Nathan Drake, Ratchet and Clank, or Jak and Daxter. Sucker Punch did an amazing job bringing these characters to life with finely tuned gameplay and a surprisingly engaging narrative. Sly Cooper and the Thievius Raccoonus is still a good looking game. It benefits from a cell shaded art that makes it look like a comic book or cartoon brought to life. It’s an aesthetic that ages really well and has been adapted by a lot of games. Sure, lip syncing is non-existent, but that didn’t bother me too much. Even all these years later, I found myself really excited by all of the visually distinct areas. The greens are lush, the deserts look suitably hot, and snow levels look frigid. Are the worlds all different archetypes that you see in plenty of other platformers? Yeah; there’s a snow world, a desert, a lava world, etc. But that’s okay because they are REALLY well designed. The story is so easy to get behind. It’s truly disturbing what the Fiendish Five did to Sly, murdering his family in cold blood and jealousy taking Sly’s birthright. Rooting for Sly comes naturally, and taking each of the gang members down one by one is intensely satisfying. The villains are despicable characters who do horrible things, and they each have detailed backstories; you understand how they became the people they are today, but that doesn’t make you sympathize with them or anything. This is in a “kids game.” On top of this, the final baddie, Clockwork, is SCARY. He’s pure unadulterated evil and one of my favorite platformer villains. 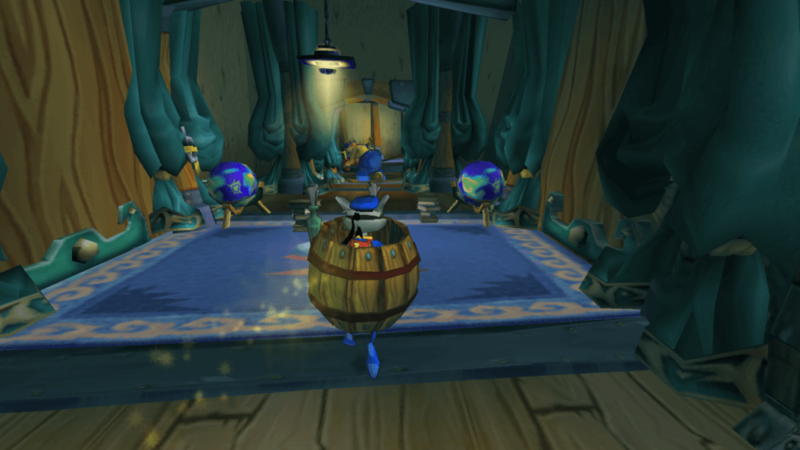 From a gameplay perspective, Sly Cooper and the Thievius Raccoonus mostly plays like a dream. There are times when Sly won’t adhere to a pipe when he should, or land a ninja spire jump when he shouldn’t. Overall, however, the platforming REALLY shines. The level design is excellent, facilitating the gameplay. You start the game with the basic moves: pipe climbing, tightrope walking, jumping, double jumping, etc. What changes up the gameplay is collecting all the bottles in the environment of each level to unlock a safe, which grants you new abilities. These abilities include a roll, a dive attack, fast-mo and slow-mo, and more. When you combine these moves, particularly the dive and roll moves, it definitely shifts how you play the game. I routinely used the roll move to close the gap between enemies, or even just to move across the environment faster. The dive move, however, is most useful in combat, as it allows you to attack from a greater distance if you time it correctly. The sound design for Sly Cooper and the Thievius Raccoonus is excellent as well, from the fantastic voice acting to the satisfying noise coins make when you pick them up to the meaty whap elicited from hacking enemies with your cane. The music is also excellent; I honestly wish I could get my hands on an album for the score of these games, as all three have great soundtracks. Thievius Racoonus has a solid playtime, coming in about 7 hours, 8 if you want to platinum the game. That sounds short, but its no longer a full priced game (the collection is about twenty U.S. dollars) and I seriously doubt you’ll only play through it one time; it’s such an infectiously fun game for the most part. I say “for the most part” because there are some issues in the difficulty area. Look, I’m all for hard games, and one hit deaths in platformers are fine and all, as long as it feels like you died fairly. There were quite a few times where I got cheaped out, whether it be by a boss that hit me when they probably shouldn’t have, or the way that I clipped through pipes and fell to my doom. On top of that, some of the boss fights are obnoxious, Ruby’s in particular; maybe it’s just me, but it felt like it was hard to tell which prompt came first. That results in a lot of deaths, and to put the icing on the cake, they start you back at the beginning of the fight every time you lose. It’s irritating, but bear in mind the time in which the game was made, and that checkpoints didn’t work the way they do nowadays. But after replaying the Clockwork fight several times from the beginning after getting to the final phase, it really starts to wear on you. Also, the driving sequences are pretty bad; the controls are rough and they almost feel impossible to beat on a first try. The AI stays ahead of you constantly, and they seemingly don’t make very many mistakes for you to take advantage of and get ahead. You really have to nail every nitro boost and make ZERO mistakes or they’ll just overtake you again and you’ll return to the back of the pack. That being said, the overall experience is one of the best PlayStation games of all time. Sly Cooper and the Thievius Raccoonus is a fun, funny, and challenging romp through a world of anthropomorphic animals, thieves and criminals. The platforming gameplay is finely tuned, the characters are instantly memorable, and it has one of the best art styles ever. It’s a gaming classic and should be enjoyed by everyone. Pick it up; its mega cheap now. What did you think of Sly Cooper and the Thievius Raccoonus? Let me know in the comments below! Stay nerdy everyone! Sly Cooper and the Thievius Raccoonus is a fun, funny, and challenging romp through a world of anthropomorphic animals, thieves and criminals. The platforming gameplay is finely tuned, the characters are instantly memorable, and it has one of the best art styles ever.